When a local pet club refuses to admit one boy and his tiny elephant, he decides to go his own way. Adorable illustrations and unusual pets make this story of inclusion a complete charmer. After a little boy and his tiny elephant are barred from the Pet Club, they befriend other children with unusual pets. The first-person narrative has a quiet, contemplative feel: “The trouble with having a tiny elephant for a pet is that you never quite fit in. / No one else has an elephant.” His pet is shy of sidewalk cracks: “I always go back and help him over. That’s what friends do: lift each other over the cracks.” Embodying dejection after the two turn from that large, titular sign on the door, a double-page spread—a Photoshop-augmented linoleum block print—depicts a dark teal cityscape slashed with raindrops and bobbing with black umbrellas. The Caucasian boy, his pet (in matching red scarves), and a little African-American girl in cornrows and a red-and-orange striped dress are the bright spots in this poignant tableau. Turns out that this girl—a pet skunk curled on her lap—has been turned away too. “He doesn’t stink,” she says. “No, he doesn’t,” concurs the boy and then suggests, “What if we start our own club?” Observant children will spot a porcupine, penguin, and giraffe peering from brownstone windows along the way; they and their children join others with equally exotic pets. Yoo’s concluding scenes depict a treehouse occupation (its restrictive message changed to “ALL ARE WELCOME”) and multiethnic, multispecies harmony. Having a tiny elephant for a pet sounds idyllic, but a boy discovers that the local Pet Club doesn’t allow them; a stern girl points at a “Strictly No Elephants” sign. Heading home in the rain, the boy and his elephant spot a girl with her skunk. “They don’t want us to play with them either,” she says. Joined by other owners of unexpected pets—giraffes, armadillos, even a small narwhal in a bowl—they make their own club with its own sign: “All Are Welcome.” In her first picture book, Mantchev (Ticker) examines true friendship, sprinkling observations about the behavior of boy and elephant throughout (“He doesn’t like the cracks in the sidewalk much. I always go back and help him over”) and punctuating them with the refrain, “Because that’s what friends do.” Yoo’s (Hands Say Love) linoleum block prints of brick buildings and quiet sidewalks have the softness and warmth of a favorite blanket. It’s a message book about exclusion with an oh-so-gentle lead-in for discussion. It’s Pet Club Day, and the sign on the door at #17 clearly states, “Strictly NO Elephants.” Current members treasure their birds, fish, cats, and dogs, but a young boy taking a walk with his tiny elephant, sharing an umbrella in a cool fall rain, sees no welcome for his friend, so he simply gives his usual support. 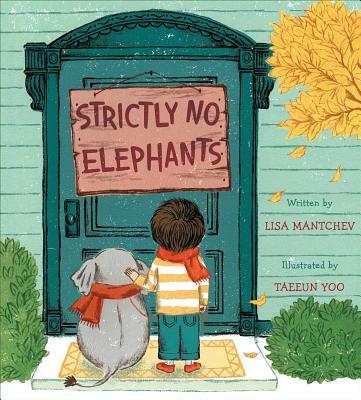 “That’s what friends do—lift each other over the cracks…brave the scary things for you.” The boy and his elephant meet a girl with a skunk, who were also excluded from the Pet Club meeting, and decide to start a club of their own, one in which all are welcome. Friends “never leave anyone behind.” Illustrations emphasize the warmth of this message with Photoshop, block prints, and pencil in color spreads alternated with smaller vignettes highlighting the expressions of the children and their pets. VERDICT With a gentle message of inclusion and helping others, this title reaches beyond a mere friendship story. A solid general purchase for libraries and classrooms. “The trouble with having a tiny elephant for a pet is that you never quite fit in,” says a little boy with a tiny pet elephant. The Pet Club won’t let him in, and an angry sign—“Strictly No Elephants”—explains why. Forlorn, the boy and little elephant stumble on, the boy’s warm-toned shirt popping against the background of people in dark blues, blacks, and teal. They find another outcast, a little girl with a skunk, and they decide to start their own club. Soon, owners with other unusual pets join them: a girl with a giraffe, a boy with a hedgehog, even a kid with a tiny narwhal in a glass bowl! Eagle-eyed little ones will notice new friends before they make their way to the pet parade. Though the story is slight, the clear message of inclusion is a good one, and the cheerful, lightly mottled block-print illustrations, with bright outlines and in a rich palette, exude lively motion among the children and their pets. Heartening, particularly for kids who often feel left out. A sunny, smart, tongue-in-cheek tale by Lisa Mantchev. . . . How nice . . . to imagine such a peacable kingdom in our midst, especially as depicted in Taeeun Yoo's intimate, warmly rounded and colored mixed-media illustrations--a richly textured meld of drawing and linocut art finished off in the Photoshop blender.